Can't see specific glyphs or the exact letter spacing in your apps? The bad news is that about every app out there has its own level of implementation of OpenType features. And accessing there features can be pretty different across apps, so let's dive a few ones from Adobe, Apple or Microsoft. 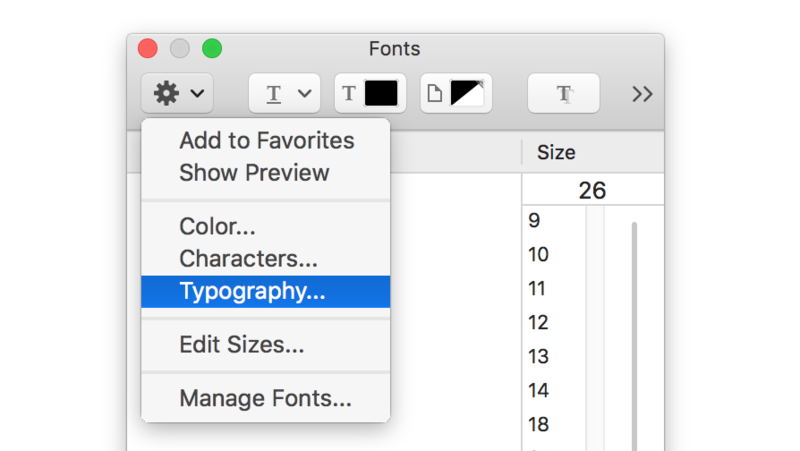 Go to Format > Font > Show Fonts or press Command-T. Then click the gear icon (circled) and choose Typography. Then, select the text you want to edit (the Typography panel is context sensitive, based on the selected font). 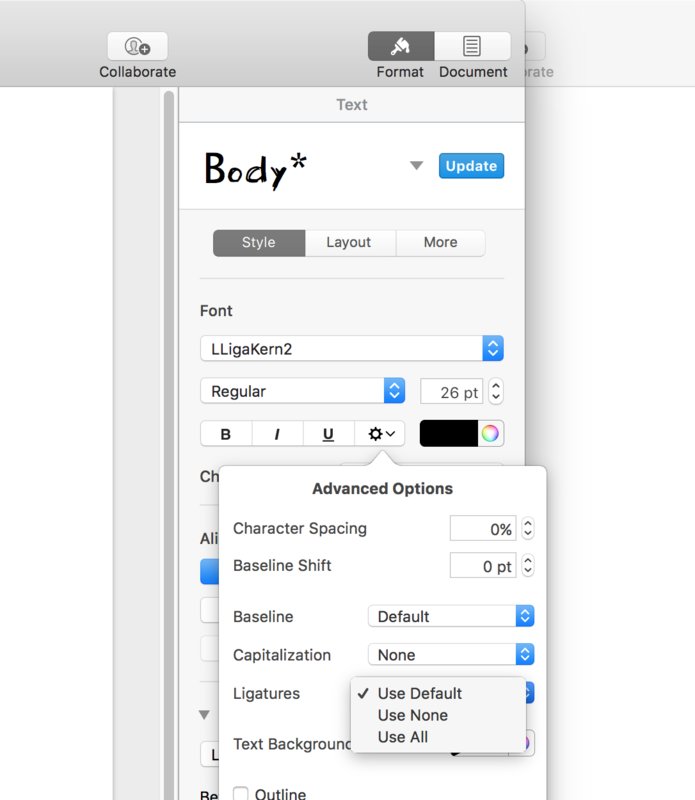 Depending on the features included in your font, you will ben able to switch each feature individually. 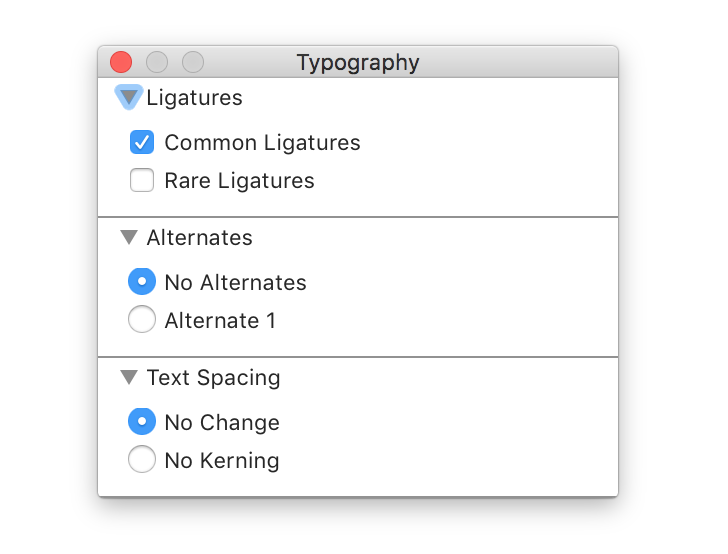 Also note that you can set the ligatures setting via the Advanced Options in the Format > Font Style panel. Kerning, ligatures & alternates are not activated by default, they must be enabled manually, and while they are supported in more recent versions of MS apps, alternates will work in Word 2011 but may not work in older versions, like Word 2008. ⚠️In recent Word versions (including Office 365), ligatures & kerning do not always work right away: try to enter some text and activate these feature from a new empty document to ensure they are REALLY not working (yep, Microsoft, please fix these decade-long issues...). Also, due to bugs in previous version of Fontself Maker (2.3.1 and older) such features could not work as expected. Just open them in Fontself Maker 2.3.2 or newer and Save/Export them again to check.